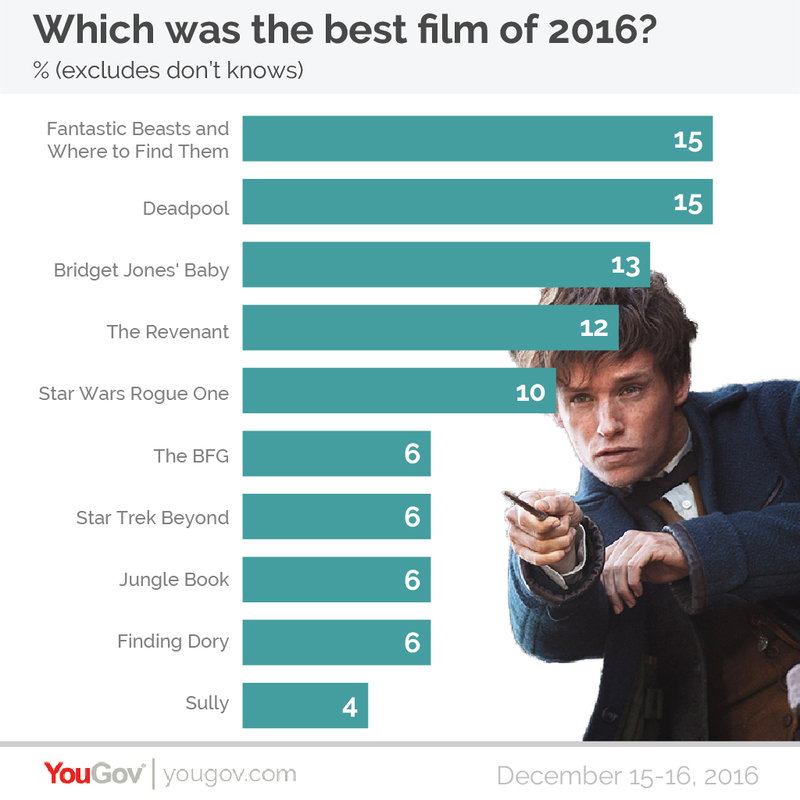 December 29, 2016, 10:36 a.m.
With 2016 drawing to a close, YouGov has asked Britons to consider their favourite events, people and forms of entertainment from acros the past year. Here&apos;s what we found. Tied for first place in the public’s affections at 15% (excluding don’t knows) are two very different films. Fantastic Beasts and Where to Find Them is the latest movie set in JK Rowling’s family-friendly Harry Potter universe. Deadpool is the polar opposite. A film that revels in its adult-only rating, the movie depicts a foul-mouthed antihero on a violent quest for vengeance. Where Fantastic Beasts was similarly well-liked (at between 14%-18%) across the age ranges, Deadpool&apos;s support was much more concentrated - favoured by younger age groups (including a quarter of 18-24 year olds) but shunned by older ones. Men also strongly preferred Deadpool (22%), whereas women were most likely to opt for Bridget Jones’s Baby (20%). 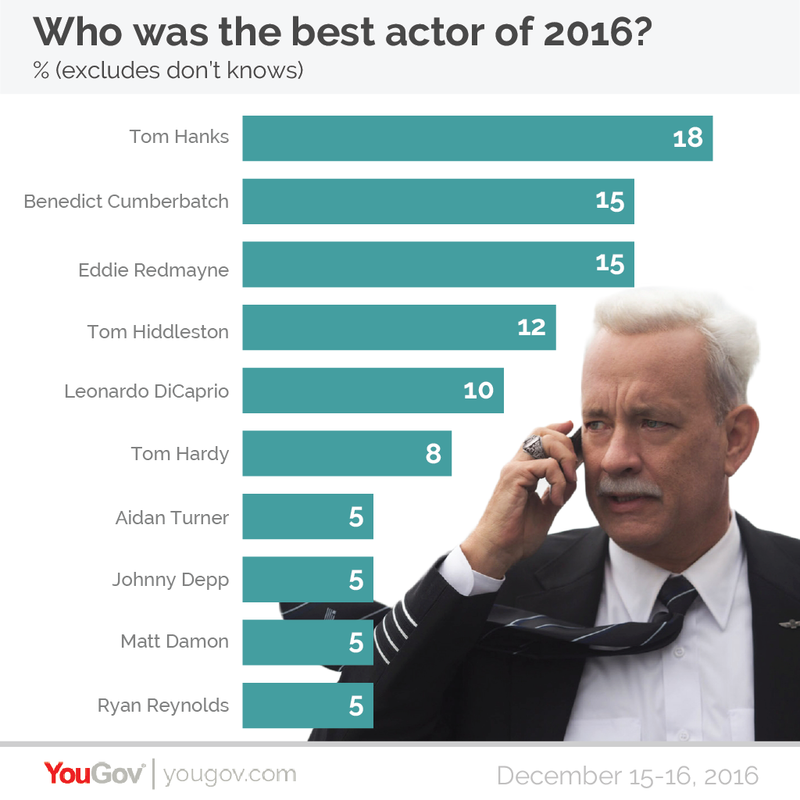 Brits consider Tom Hanks to be the best actor of 2016, with 18% of the vote (after don’t knows are excluded). Hanks starred in three movies this year: A Hologram for the King, Sully (pictured) and the third film in the Robert Langdon film series, Inferno. Leonardo di Caprio, who finally won an Oscar for best actor for his performance in The Revenant at this year’s Academy Awards, came in fifth at 10% (admittedly, The Revenant was released in 2015). 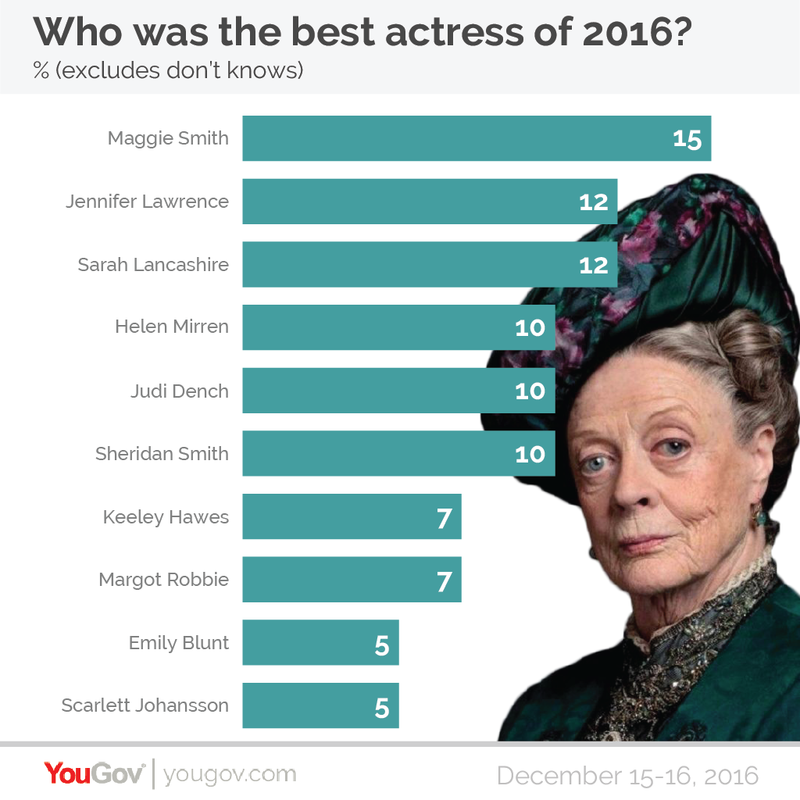 Dame Maggie Smith has been judged by the British public to be the best actress of 2016 at 15% (excluding don’t knows) – a particularly impressive feat when you consider the fact that she has not appeared in any new work this year. Dame Maggie has, however, been presented awards by both the Critics&apos; Circle and the University of Oxford&apos;s Bodleian Libraries in 2016 for her contribution to the arts. British superstar Adele is the best music artist of 2016, receiving the backing of 29% of Brits with an opinion. Adele’s last album was released in November 2015, and she has been touring worldwide in support of the album for almost the entirety of this year. 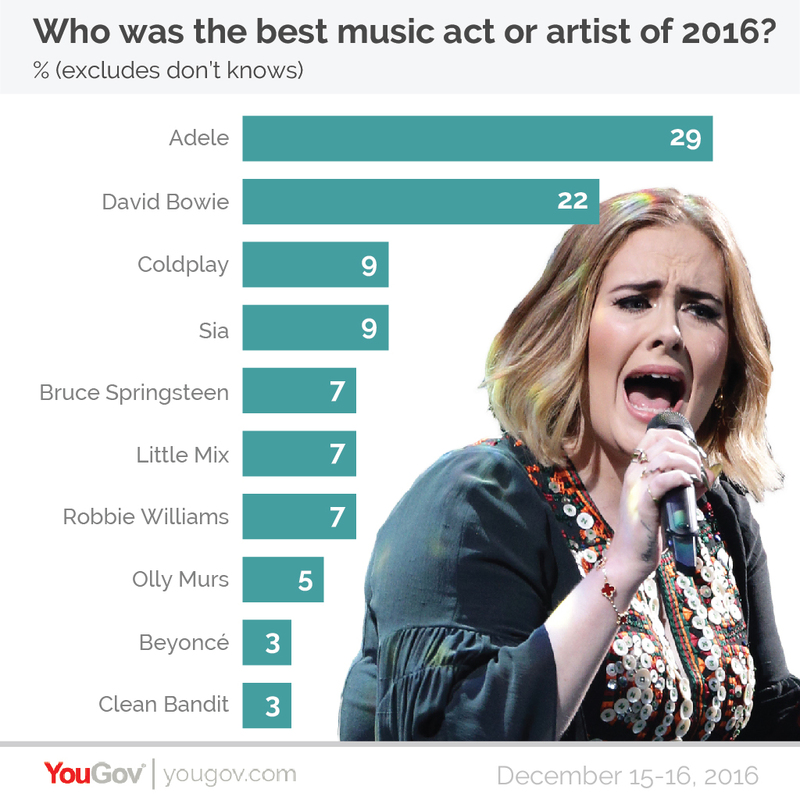 David Bowie, who sadly passed away in January of this year, was chosen by 22% of Britons as this year’s best artist. His last album, Blackstar, was released on 8th January, just two days before Bowie’s death. The album received positive reviews from critics, and has been nominated for Best Alternative Music Award at the 2017 Grammys. 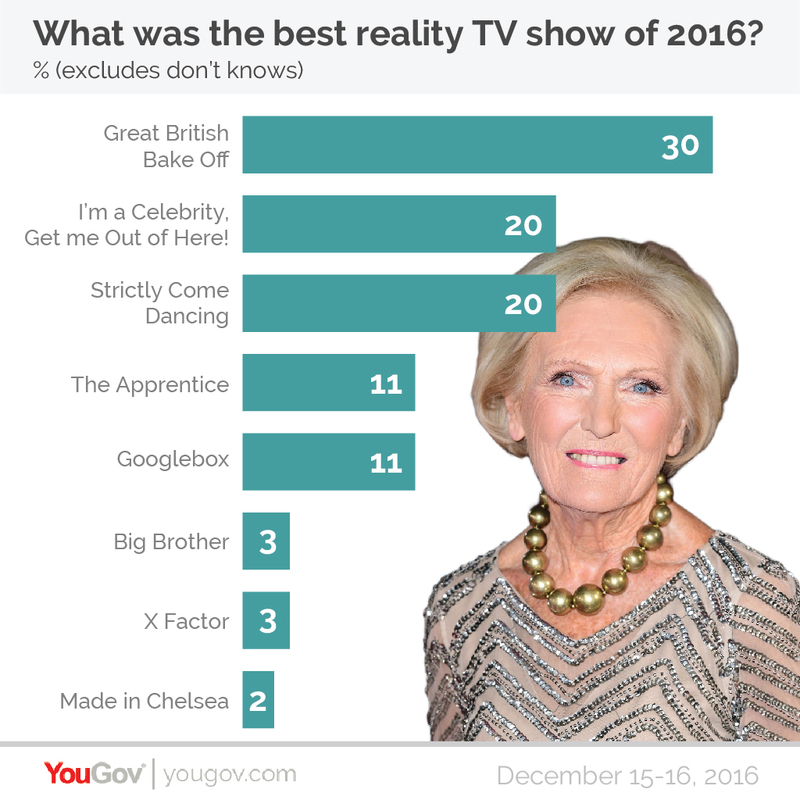 The Great British Bake Off was Britain’s favourite reality TV show of 2016 (as well as being the third favourite TV show of any genre), backed by 30% of those with an opinion. The show faced a public backlash when it was announced in September that the format had been bought by Channel 4. Three of the show’s four main stars have subsequently left the programme and a rival BBC show starring Mary Berry, Sue Perkins and Mel Geidroyc is reported to be in the works. 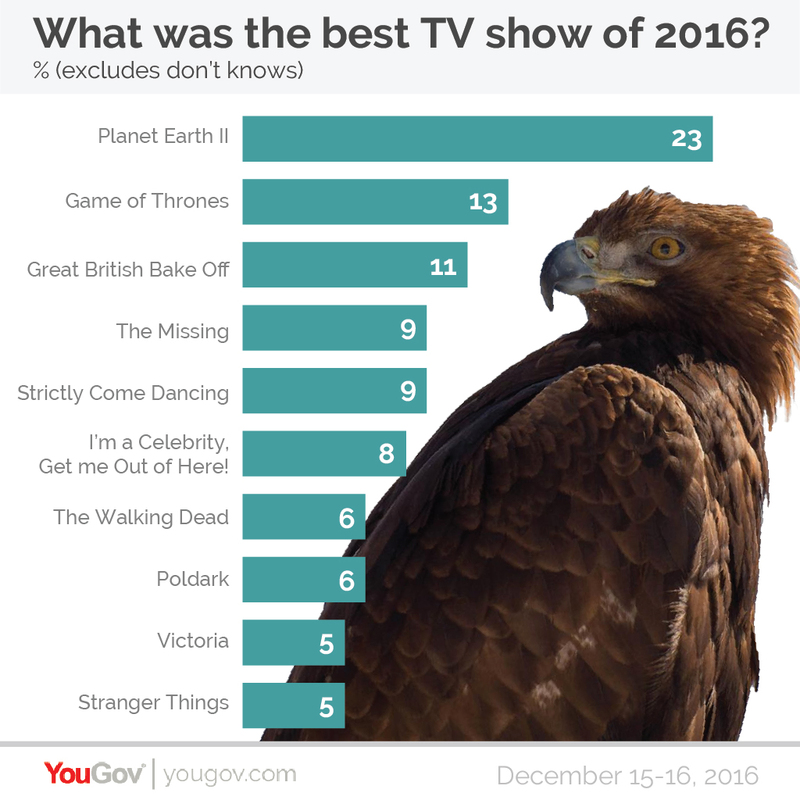 Nature documentary sensation Planet Earth II is Britain’s favourite TV show of 2016, with nearly a quarter of those with an opinion (23%) selecting it as the year’s best series. With each episode reportedly taking three years to make and presented by national treasure Sir David Attenborough, the show brought in more than 12 million viewers - the highest ever for a documentary series since the current ratings system began. 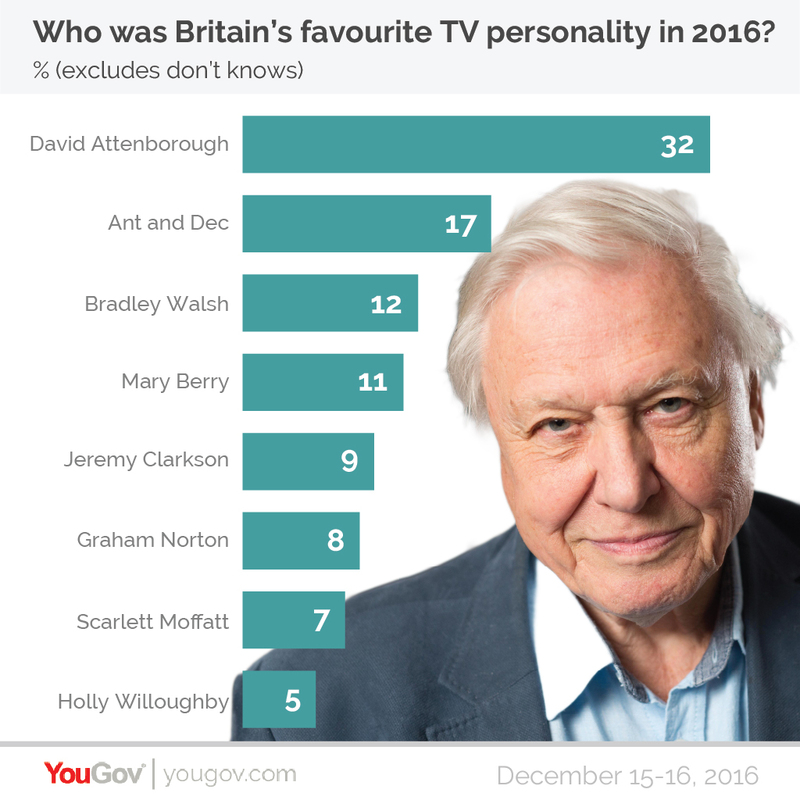 Sir David Attenborough himself is firmly this year&apos;s most popular star of the small screen, according to the British public. Almost a third of people with an opinion (32%) chose the broadcaster and naturalist as this year’s top TV personality. 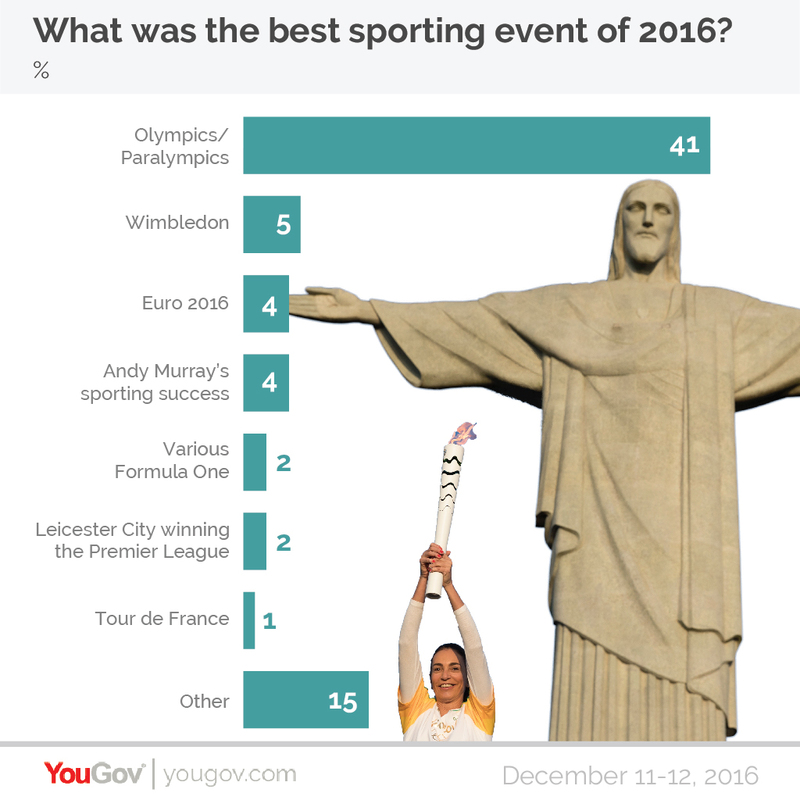 Rio 2016 dominates the list of this year’s best sporting events, with 41% of people choosing it. This year’s Wimbledon tournament comes a very distant second at 5%, and Andy Murray’s various victories this year – for which he won BBC Sports Personality of the Year for a record third time – together gathered a further 4% of the vote (14% among Scots). The Olympics is also the best event of the year overall according to Brits (23%). 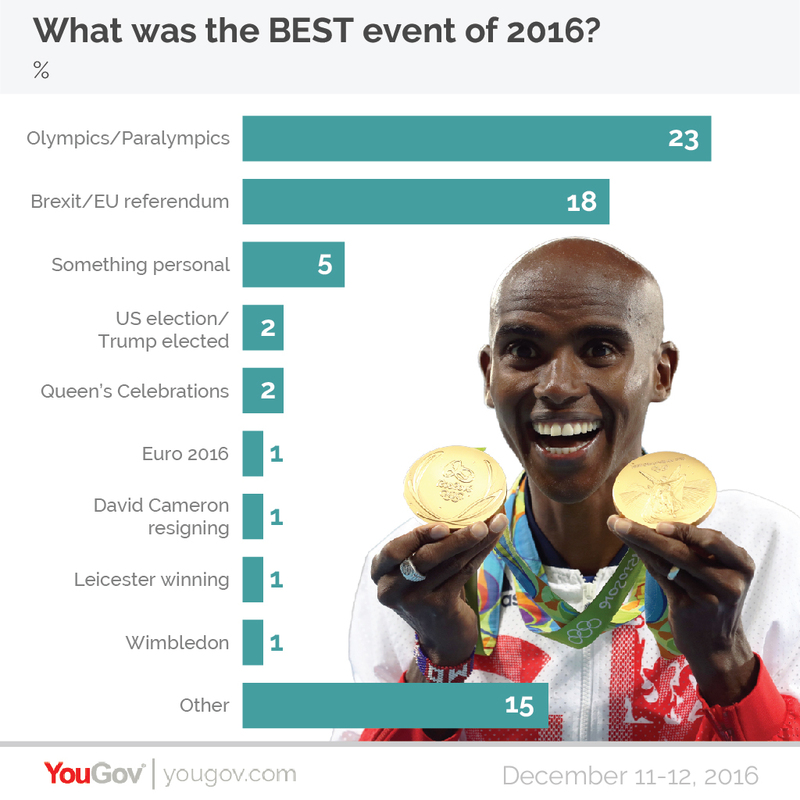 A YouGov survey from just after the Games found that Britain’s favourite Olympic moment was Mo Farah’s double gold medal performance. Brexit is seen as the second best event of 2016, being chosen by 18% of Brits. Unsurprisingly, there is a political dimension to this choice: 38% of those who voted to Leave the EU say Brexit is the best event of 2016, including 46% of UKIP voters and 25% of Conservative voters. 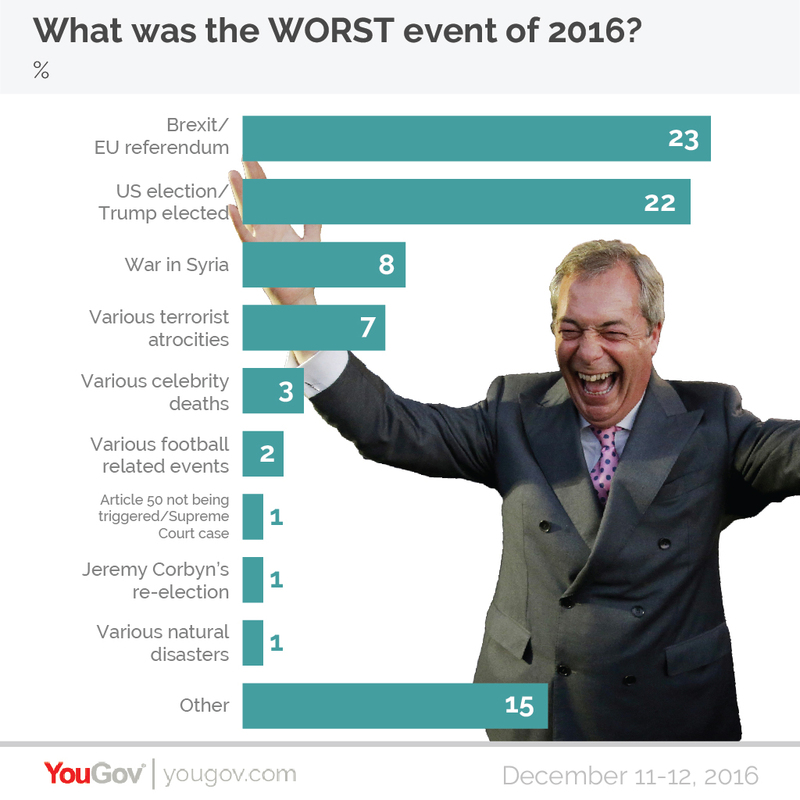 By contrast, 23% of those with an opinion consider Brexit to be the worst event of 2016. This rises to 43% of Remain voters, as well as 34% of Labour voters and 36% of Liberal Democrat voters. However, Brexit has hot competition for Britons’ worst event of the year in the form of Donald Trump’s election victory (22%). Asking the British public who, for better or for worse, has had the biggest impact on the world in 2016 yields the same result as Time Magazine&apos;s identical annual test: Donald Trump. 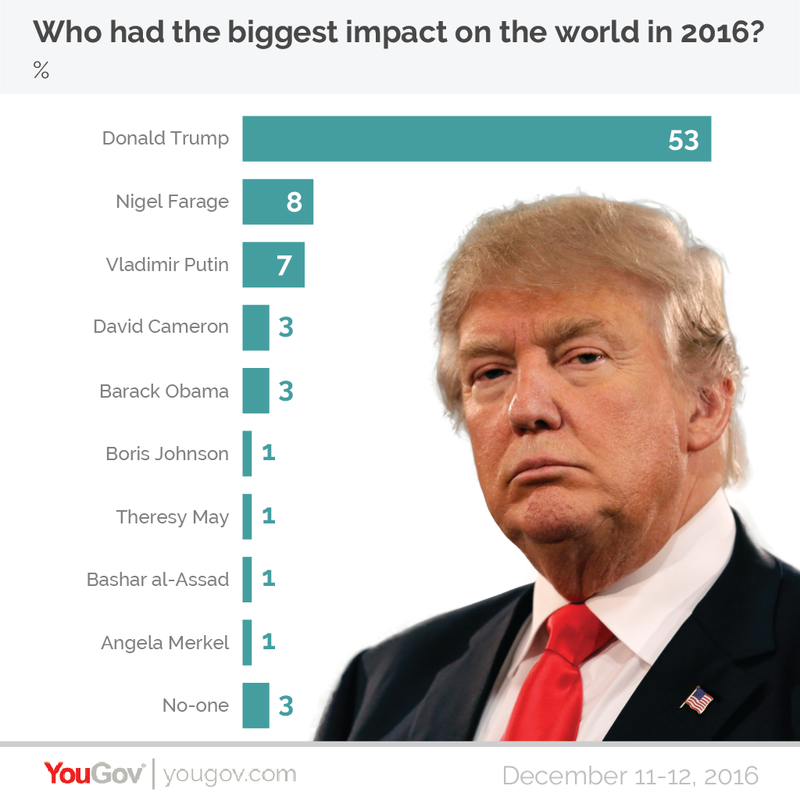 Trump wins by a landslide, with more than half of Brits with an opinion (53%) considering the president-elect to be the person who has shaped the world more than any other this year. Nigel Farage, the former UKIP leader and one of the architects of Brexit, comes in a very distant second at just 8% (although he was picked by 20% of UKIP voters).